Romantic gifts waiting for you in your room including fresh flowers & champagne with toasting Flutes for just $59.00+tax* plus cost of room. 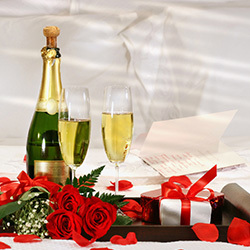 Romantic gifts waiting for you in your room including a dozen roses, box of assorted chocolates & champagne with toasting flutes and rose petals sprinkled on your bed for just $99.00+tax* plus cost of room. Includes a birthday cake with name, candles, balloons, confetti, happy birthday sign, a small gift basket including chocolate, candy and novelties for just $85.00+tax** plus cost of room. *2-Day advance notice. 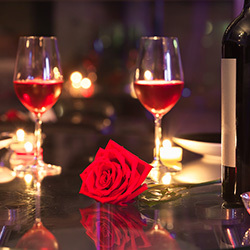 To make arrangements, please call the 3 Palms reservations department and request the Romance Package, or book online on our website. After you book your room on our website you will be able to select packages including the Romance Package from our online shopping cart. Service of alcohol is subject to state and local laws. Must be of legal drinking age. If alcohol is not permissible by law, sparking cider will be substituted. **Package price does not include room. 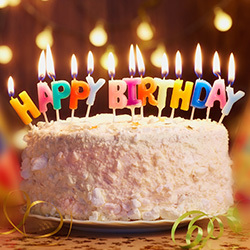 Book your room first online then you will be directed to our online shopping cart where you will be able to book your Birthday Package and leave us any special notes. 3 Palms is a boutique hotel offering comfortable deluxe accommodations, fine dining and a wide variety of entertainment nearby, making any stay here one of the best Scottsdale hotel deals available. This all-inclusive resort property caters to guests traveling for all purposes. When planning your Arizona family vacation, romantic getaway, business trip or vacation with friends, be sure to check out the amazing Scottsdale deals offered at 3 Palms. Immaculate service is apparent in each aspect of 3 Palms and the rooms and suites offered here provide top-notch luxury and comfort with amazing Scottsdale deals. All deluxe rooms and suites make a wonderful place to stay for varying clientele. Leisurely guests will appreciate the 50-inch televisions. Relax in luxury and enjoy a snack from the Vending Area or use your in-room microwave to heat one up. The home-like rooms provide king or queen-sized beds dressed in 400 thread-count linens, down duvets and four plush pillows so guests can sleep peacefully. Guests on vacation will be hard-pressed to find better Scottsdale hotel deals than the ones offered at 3 Palms. Guests traveling on business will appreciate the amazing Scottsdale deals as well, with rooms that cater to the work-focused visitors as well as leisurely guests. Work desks are provided in each room and suite, with complimentary wireless internet and dual phone lines, so guests can stay connected to clients and co-workers. 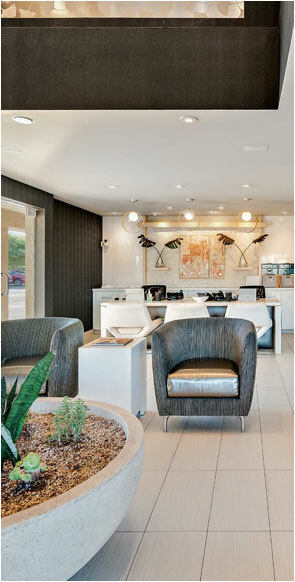 3 Palms truly offers the top Scottsdale hotel deals for business travelers. Not only is 3 Palms a fabulous getaway for visitors on varying types of trips, but it's located near some of the best entertainment Arizona has to offer. Downtown Scottsdale features art galleries, cultural festivities, specialty shops and more. Guests seeking art in various forms can cure their craving at the Scottsdale Center for the Performing Arts or stroll through the Scottsdale Museum of Contemporary Art. In a city full of culture, guests of 3 Palms will be steps away from unlimited fun. Its location alone makes 3 Palms one of the best Scottsdale hotel deals for vacationers. 3 Palms offers extravagant accommodations, friendly service and amenities for all types of travelers that make this one of the best Scottsdale hotel deals around. 3 Palms offers amazing rates on luxurious stays.